This is the Second in a series of posts on Raising Support in ministry. Read the First for an intro. I spent 10 weeks this spring raising support. I learned a lot along the way and wanted to share the wealth. I thought it would be interesting/helpful to share statistics from my personal experience. For those that were long distance (too far to drive to have an appointment with) I emailed or Facebook messaged to try to set up a phone appt (click to download a Word doc of what I say in the email). My theory on the reason for that high percentage is that if they took the time to talk on the phone they had likely already made up their mind to support us. 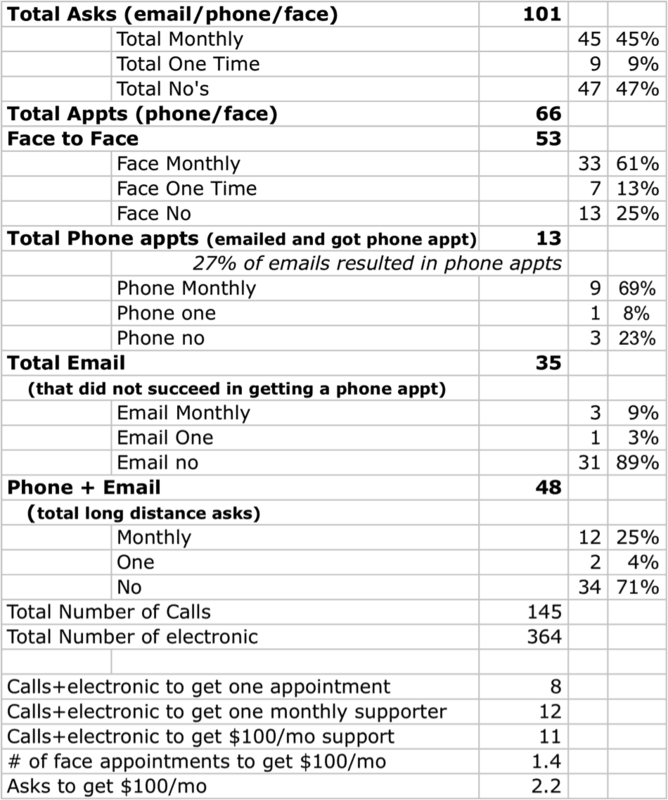 Of those “conversations” that were just conducted via email/Facebook, 89% resulted in a “no”. 3 people joined our monthly support team with just conversation over email/Facebook. So meeting Face to Face is the quickest (though slow!) way to raise support. Would love to hear from you: any insights jump out at you? What surprised you? Does this match up pretty closely with your experience? Tomorrow I will share some Biblical foundations that were helpful for me as I raised support. This data is phenomenal, Tim. Thanks for taking the time to put this together and share it with us. It’s incredibly helpful knowing what others are experiencing during support raising. Thanks for the encouragement Jordan! I found it interesting/helpful and thought others might too.